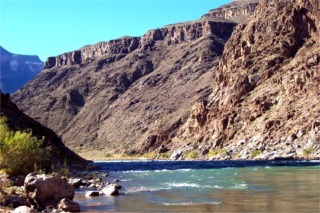 From the tribal town of Peach Springs you can drive a local road to the Colorado river. We spent the night in the lodge on the reservation. It was very nice and reasonable. This time of year it was pretty empty also. For information see the lodge. It is the only place between Pearce Ferry and Lees Ferry that you can do this. It is a dirt road that while wide can be pretty bumpy. They told me it was a 6 mile drive but was 18.5 miles. It will cost you $5 per person to drive down but if you have a vehicle you want to take down go for it. This view is near the start. Notice all the trees and greenery. You also see the cliffs way off in the distance. This shot is a few miles further in. Still a lot of greenery but fewer trees. There are now some walls to the side of us. 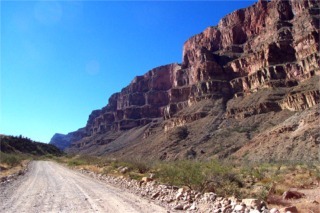 For the first few miles, the road passes along a dry, dusty stream bed in a small canyon, past clumps of trees and bushes, and then crosses more open land with scattered cacti - close to the springs after which canyon and town are named. 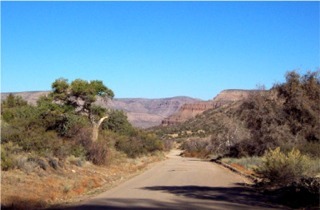 The canyon proper starts 6 miles from town - the road through it is quite straight and the surface is fine for normal cars although a bit uneven in places. It is pretty bumpy you might want to consider it for a rental car<grin>. As the canyon deepens, the types of cacti and other plants change noticeably. The surrounding cliffs become steadily higher and more impressive, and several side canyons join from both sides, including the ominous-sounding Hells Canyon. 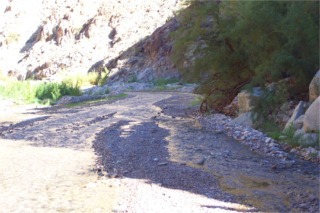 The last branch is Diamond Creek Canyon, which has water flowing through all year round. The road then crosses the creek about 6 times, and for a short distance runs along the streambed. The water was at most 4 inches deep There was an area we drove though that might have been 6 inches at most. There is a place to park and camping area just before the first stream crossing. 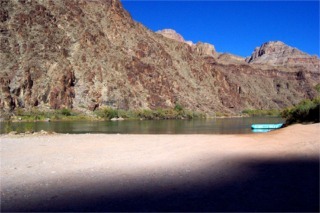 1.5 miles after the creek is first encountered, the road emerges onto a wide, sandy beach beside the Colorado river, a total journey time of almost 2 hours. The road is so bumpy that you can't drive very fast. The total distance was 18.5 miles. There are a few picnic tables on this beach so bring a lunch and enjoy the scenery. The river current is much to fast for swimming and the water way too cold. 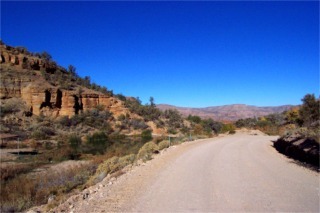 The temperature is always at least 20° hotter at the river compared with the land around the main road (US 66) due to the 3,400 foot elevation difference; it often exceeds 100° in the summer. The fast-moving Colorado is always cold - 60° in June. It wasn't much colder in November, maybe 50. It is well worth the drive and the scenery is spectacular. Very few people go down here. There is a tour from Vegas that will show up around 11:30.